I prepared the pictures and took the recipe with me intending to publish this post while away visiting my parents. But, as the days went by it only felt right to take a break from blogging and to swap it for the enjoyment of having my mother and father just for myself for a while. So I did! Besides, it would have been wrong to rush this post, because it's so special in it's simplicity, that is often served at the weddings and goes well back into the history of Eastern civilization. Whoever came up with it has to be saluted for their imagination. My idea of pilaf (pilav) is however slightly different from theirs and does not include as much spices and raisins as I found on Turkish recipe sites. Where I come from people haven't got a lot of understanding for mixing sweet ingredients into savoury dishes (except in small amounts to balance the flavours ). If you do, put some pine-nuts and currants into the chicken breasts filling. In a large pan, heat a bit of oil and add the onion and celery. Slowly fry without colouring them for at least 10 minutes, then add the rice. Stir in the wine or cider and let it cook until the liquid was absorbed. Now add first ladle of hot stock. Turn the heat down to a simmer and keep adding stock allowing each batch to be absorbed before adding the next. Carry on adding stock until the rice is softer outside but with a slight bite. Meanwhile, get a dry griddle pan hot and grill the mushrooms until soft, add them to the rice. If you are using chicken add the hot meat. Season to taste and add chopped almonds. Let it cool down. In the meanwhile make the dough by combining all the ingredients. 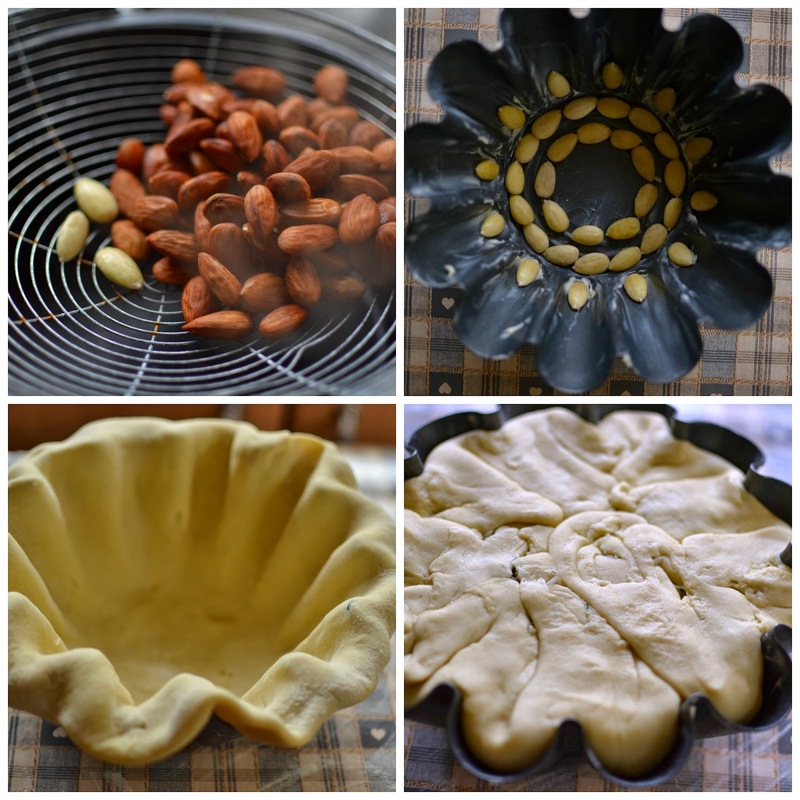 Grease the mould with softened butter, arrange the almonds and place into the fridge for few minutes to hardener. Roll the dough into the desired shape slightly bigger then your mould and place it in, with the ends hanging over the edges. Pour your rice in, tuck it in nicely, then cover the top with the hanging part of the dough. Close neatly and bake until golden brown.